This class seems like pretty useless. effect : range+2, magic attack with 50% chance freeze. 50% return to deck. Last edited by Zhao on Wed Jul 11, 2012 8:29 pm, edited 2 times in total. I agree. Totally useless. I summon them first out front in hopes of the enemy wasting a spell on them, because I sure as heck don't care about them. 1. A skilled military shooter detailed to spot and pick off enemy soldiers from a concealed place. Agree. They are WORSE than useless. A different tech of a lower color is better than having a sniper in the deck. Maybe the sniper could have even more range, all the way to reach the back row. At the least, plus +4 range rather than +3 or make 4/4 like the Shaman, which is better in EVERY way, except for one less range. And give it a special like "persistence" or "lock-on" or "focus" (whatever you want to call it) where once it hits someone, it will target them every turn until they are dead. The "use" of the sniper is to have a fast drop for the purple for its race. The comparison to the 4/4 Shaman is a good comparison however, and it does show that the sniper to be rather weaker. They are both 1 turn drops. The shaman has 2 passive abilities, 1 that increases range and has an on use proc, and 1 that compensates for the low stamina of the card. Additionally it is important to note that the shaman also does magic damage thus bypassing heavy armor. Now when we compare this to the sniper, the snipers base health and damage are both considerably lower. And it only has 1 ability, that makes its damage equivalent to magic, and increases its range. It however has nothing that compensates for the cards low stamina, and it also doesn't have any kind of equivalent to the snare ability. In comparison to the Guardian it also comes up looking rather flimsy. The guardian having considerably more staying power. And vigilance. Vigilance is a somewhat frustrating ability in that it causes the unit to often get hung up on unhittable targets, but is also necessary in at least a small amount in every deck because it is the only thing that can clear units off of the players. The warrior is the closest to the sniper in relative power in my opinion to the sniper but is still clearly superior. The warriors damage and stamina are both much higher, but it is also affected by heavy armor so that fact is somewhat tempered, so if this were all the warrior had I would say it only had a slight advantage over the sniper in that it can survive longer. But the warrior also moves fast, allowing it to close on the target which is very important. My suggestion to fix the sniper is to give them "camouflage" to make them unable to be targeted by spells. Then to fill the rest of the gap I think it would need a bit of something else. Either bumped up to 4/4 or give it +1 range and extend the camouflage so that it cannot be hit at a range beyond 2 spaces. This would give the sniper a distinct niche and make up for its low stats. It could hit at a distance, and not be hit at that same distance. It would still give the sniper a disadvantage against all rogue types, those that melee and close fast. But would make it stronger against casters and other shooter units. vuduman78 wrote: In comparison to the Guardian it also comes up looking rather flimsy. The guardian having considerably more staying power. And vigilance. Vigilance is a somewhat frustrating ability in that it causes the unit to often get hung up on unhittable targets, but is also necessary in at least a small amount in every deck because it is the only thing that can clear units off of the players. What if sniper were to get a great raise in crit rate, like 30% critical increase. I'm confused, purple sniper's are 4/4, not 3/3, I'm pretty sure. But yeah, not particularly great since a sniper is basically a shaman without freeze or return. The only idea I can think of is that since sniper's are tech heroes instead of build, they'll have a higher crit rate from their higher tech stat. Which is more useful than the higher parry rate shamans get from higher build. Still, it's quite a stretch to say this tiny advantage compensates for the loss of return and freeze. All the same, I think some sort of attempt to re-vamp sniper card would drastically change the relative value of decks which many players have already spent a lot of time building, and I'd be against it. Abilities like camouflage or +30% crit rate would completely unbalance the current set up, turning the weakest card, which savvy players have spent a year or more avoiding or changing into something better, into one of the better cards and putting those players at disadvantage because they wisely chose not to include them in their deck. I'd recommend using equipment (my preferred method), coupons or gold to change primary stat of tech humans to something else. Then it doesn't matter how useless snipers are, 'cause you don't have any! yep, sniper's are definitely 4/4, just like shamans. Sorry I'm not computer savvy enough to figure how to crop this image and all that. 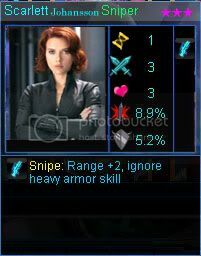 Note however that this image is actually from the game and not something created (apparently from a green sniper's (those actually are 3/3) stats, a picture of scarlett johansenn, and I guess the border of a genuinely purple card). well that's pretty interesting to hear.. i also like to handle a good sniper and this is the stats i need..